Isn’t this great? 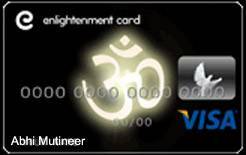 I can’t wait to get my new VISA card that has an AUM or Buddha’s face on it! I don’t know about anyone else, but when I saw an ad for this I let out a groan. Using Buddha or the AUM symbol to market something that is the epitome of a capitalist society just rubs me the wrong way. Sort of like when I see the images of Hindu gods and goddesses on underwear or see a cocktail called the “Buddha Bomb” on a menu — a tad distasteful to me, but maybe I’m just overly sensitive to things like that. While I commend VISA for the concept of the card holders’ points going toward socially conscious projects such as Youth Aids or Rainforest Action Netork, there is also something about using these images to promote accumulating more unnecessary junk in our lives that is disingenuous to me. To me, yoga and the spiritual path are about downsizing. Ridding our lives of clutter, both physical and emotional, in order to strip us down to our bare essence, to our True Nature. I know for myself that the longer I walk along the yoga path, the less I “need”. I may want things — who wouldn’t want a pair of $90 yoga pants with handpainted chakra symbols flowing down the legs? — but more times than not I ask myself, yeah, but do I really need them? I could charge my next yoga retreat with this credit card, but when it comes right down to it, I don’t need a credit card with an AUM symbol on it to remind me to think globally and act locally. A few weeks ago I taught a yoga class as a benefit for a local domestic violence shelter. I had a donation box set out in the yoga studio where I teach for about two weeks before the fundraiser. I raised a lot money, but I found it amusing when a student wrote a check for $120 for a class pass, and then could not even put $1 into the donation box. That’s OK — maybe she was still paying off her credit card bill that included those chakra pants, with the matching $150 Swarovski crystal sacred energy Shakti necklace, and the $80 eco-yoga mat that she carried in the $200 real leather yoga mat bag. Later I saw the same student buying a $4 cup of coffee at the Starbucks down the street. Hmmmm…I wonder if she used that AUM card to charge that latte? So true! Want and need, not the same thing. …I felt the exact same way when I saw that credit card advertised…. I think there’s a term for this…spiritual materialism? and want and need are the not the same thing.